This peaceful relaxation-trance music flows with a gentle shamanic spirit inviting us into the heart of being. Prayerful flute melodies, relaxed heartbeat drumming and chants lead us on a magical journey. Shamanic Dream II is a pure relaxation-trance symphony and nourishment for the soul. 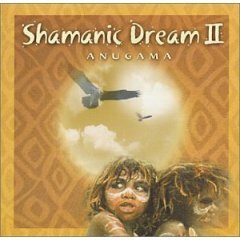 Shamanic Dream II is part of Anugama's Spiritual Environments Series. Spiritual Environments recordings use music in combination with neuro-acoustic methods to induce deep relaxation and enhance healing. This peaceful relaxation-trance music flows with a gentle shamanic spirit inviting us into the heart of being. Prayerful flute melodies, relaxed heartbeat drumming and chants lead us on a magical journey. Shamanic Dream II is a pure relaxation-trance symphony and nourishment for the soul. This sequal to Anugama's brilliant Shamanic Dream has a gentle spirit that invites us into the heart of being. Prayerful flute melodies, relaxed heartbeat drumming and chants lead us on a magical journey. Shamanic Dream II is perfect for Relaxation, Massage, Gentle Lomi Lomi, Meditation and all Healing Arts.